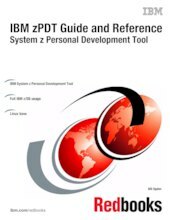 This IBM® Redbooks® publication provides both introductory information and technical details about the IBM System z® Personal Development Tool (IBM zPDT®), which produces a small System z environment suitable for application development. zPDT is a PC Linux application. When zPDT is installed (on Linux), normal System z operating systems (such as IBM z/OS®) can be run on it. zPDT provides the basic System z architecture and emulated IBM 3390 disk drives, 3270 interfaces, OSA interfaces, and so on. The systems that are discussed in this document are complex. They have elements of Linux (for the underlying PC machine), IBM z/Architecture® (for the core zPDT elements), System z I/O functions (for emulated I/O devices), z/OS (the most common System z operating system), and various applications and subsystems under z/OS. The reader is assumed to be familiar with general concepts and terminology of System z hardware and software elements, and with basic PC Linux characteristics. This book provides the primary documentation for zPDT.